Presented at the SIPI-IBBI Roundtable on "Insolvency and Bankruptcy Code, 2016: Looking Ahead - Global Learning, Local Application"
Organised at SIPI-IBBI, New Delhi. Venue: The Seanza Conference Hall, IGIDR, Mumbai. Volatility forecasting for Distance-to-Default estimation by Susan Thomas. Presented at the "Law and Global Political Economy : Heterodoxy Now" Conference organised by Institute for Global Law and Policy (IGL&P), Harvard Law School, Cambridge, MA. Presented to the participants of the "Certificate Course in Insolvency and Bankruptcy Laws and Procedure", organised by the School of Law, IICA. Presented at CAFRAL-RBI-IIM(B) Research Seminar on Financial Markets and Macroeconomics in Emerging Economies at RBI, Mumbai. Venue: the Seanza Conference Hall, Indira Gandhi Institute of Development Research, Mumbai. An international research conference, organised by IGIDR in collaboration with Vanderbilt Law School, sponsored by NSE, NSDL, PayPal and	CFA Institute. Organised at the Drawing Hall, Grand Hyatt, Mumbai. Organised at the Seanza Conference Hall, Indira Gandhi Institute of Development Research, Mumbai. Organised at the Salon Pompadour, Sofitel, Mumbai. An international research conference, organised by IGIDR in collaboration with Vanderbilt Law School, sponsored by MCX, NESL, NSE, NSDL, PayPal, PhilipCapital and CFA Institute. Organised at the Mahogany, Grand Hyatt, Mumbai. Organised at the Deck Suite Habitat World, India Habitat Centre, Lodhi Road New Delhi. Organised at the Marigold Hall, IHC, Delhi. An international research conference, organised by IGIDR, sponsored by BSE, CFA Institute, Goldman Sachs, NSDL, NSE, PayPal and PhilipCapital. Organised at the Konkan, Taj Lands End, Bandra, Mumbai. Organised at the Sofitel, BKC, Mumbai. A workshop on Pensions policy in India. Organised at National Institute of Public Finance and Policy, Satsang Vihar, New Delhi. An international research conference, organised by IGIDR, sponsored by BSE, BAML, Goldman Sachs and NSE. Do regulatory hurdles work on algorithmic trading? by Nidhi Aggarwal. The causal impact of algorithmic trading on market quality by Susan Thomas. The 1st ICSI-IGIDR Roundtable on Recovery and Resolution mechanisms for Corporate Debt. Organised at the Grand Hyatt, Santacruz, Mumbai. The imprecision of volatility indexes by Rohini Grover. Presented at 2014 Conference on High Frequency Data and Derivative Markets by AUT, Auckland, New Zealand. Do regulatory hurdles on algorithmic trading work? by Nidhi Aggarwal. Big data in finance by Chirag Anand. Eventstudies : An R package for conducting event studies by Chirag Anand. Market quality in the time of algorithmic trading by Susan Thomas. The 3rd DEA-ICSI-IGIDR Roundtable on Implementing the IFC: regulatory governance of the judicial function. An international research conference, organised by IGIDR, sponsored by BSE, Deutsche Bank, Dun & Bradstreet, ICSI and NSE. The 2nd DEA-ICSI-IGIDR Roundtable on Implementing the IFC: regulatory governance of the legislative function. The real cost of credit constraints: Evidence from micro-finance by Susan Thomas. Presented at the 8th Annual conference on empirical legal studies , organised by the University of Pennsylvania Law School, Philadelphia. Consumer Protection in the Indian Financial Code by Susan Thomas. Presented at the DEA-ICSI Conference on the FSLRC , Hyderabad. A poster session on Measuring and analysing asymmetry of liquidity by Susan Thomas. Presented at the 6th Financial Risks International Forum on Liquidity Risk, organised by Institut Louis Bachelier, Paris. An international research conference, organised by IGIDR, sponsored by Bank of America Merill Lynch, BSE, British High Commission, NSE. Roundtable on Systemic risk measurement. India's path to regulating market conduct by Susan Thomas. Presented at the FSA Annual International Seminar, held in London, hosted by the FSA, London. When do stock futures dominate price discovery? by Nidhi Aggarwal and Susan Thomas. Presented at the International conference on Futures and Derivatives Markets, held in Beijing, China. Field workshop on financial intermediaries and intermediation. The role of advisors in financial distribution by Renka Sane and Susan Thomas. Presented at the Second IFMR Financial Systems Design Conferences 2012, held in Chennai, hosted by the IFMR Trust. Measuring and analysing the asymmetry of liquidity by Rajat Tayal and Susan Thomas. Presented at the Eighth conference of the Asia-Pacific Association of Derivative, held in Busan, S. Korea, hosted by the Korea Derivatives Association. The workshop has a two-day program along with an optional first session of a one-day introduction to R. R is the remarkable platform for data analysis and computation, that is increasingly used in financial firms over the wold. This roundtable is focussed on using time series analysis tools in R to model and forecast financial market volatility. Field workshop on corporate finance. Clearing and settlement in India: review and current issues, by Rajat Tayal. The corporate bond market -- the big picture, by Susan Thomas. What should regulation do in the field of micro-finance?, by Susan Thomas. The workshop has a main two-day program along with an optional first session of a one-day introduction to R.
The focus of the workshop will be on using tools in R to analyse panel data. The data used are financial ratios for Indian firms, which will be analysed to develop models to predict the probability of default or credit rating changes of the firm. At the National Seminar on Microfinance and women's empowerment in India, organised by the Naba Ballygunge Mahavidyalaya, in collaboration with the Global Institute of Management, Kolkata, and Basundhara Institute of Social Welfare and Awareness (BISWA). An international research conference, organised by IGIDR, sponsored by Bank of America Merill Lynch, BSE, British High Commission, NSE, Nomura Securities. Liquidity considerations in volatility estimation by Rohini Grover and Susan Thomas, and When do stock futures dominate price discovery? by Nidhi Aggarwal and Susan Thomas. At the 24th Australasian Finance and Banking conference held in Sydney, Australia. Roundtable on Financial Products and Services Advisory and Distribution Regulation. A presentation by Rohini Grover and Susan Thomas, at the Seventh conference of the Asia-Pacific Association of Derivative, held in Busan, S. Korea, hosted by the Korea Derivatives Association. QFI route to foreign retail investment into Indian MFs: Issues, by Susan Thomas. The workshop had a main two-day program along with an optional first session of a one-day introduction to R. R is the remarkable platform for data analysis and computation. This roundtable focussed on using time series analysis tools in R to model and predict financial market volatility. Impact of SLBM on equity market outcomes by Rohini Grover. A few lectures on copulas by Valentyn Panchenko, School of Economics, Australian School of Business, University of New South Wales. Location: Seminar Room 2, IGIDR. A two-hour session with Deepayan Sarkar, ISI-Delhi with a first talk on An overview of R followed by a session on An introduction to Lattice held at IGIDR, 3-5pm. R is the remarkable platform for data analysis and computation. A workshop with an introduction to R followed by a session on portfolio optimisation held at IGIDR organised with Mahendra Mehta of Neural Risk Consulting Pvt. Ltd and Yohan Chalabi, ETH, Zurich. R is the remarkable platform for data analysis and computation. The IGIDR Roundtable on Microfinance regulations for India -- A policy directive, held at the Grand Hyatt, Kalina, Bombay. The first IGIDR Roundtable on MFI regulations, held at the Oberoi Trident, Bombay, on 22 February 2011. Conducted at IGIDR where the agenda focussed on NSSO, NCAER, CMIE Consumer Pyramids and the IFMR-CMF datasets. A presentation by Renuka Sane and Susan Thomas, at the conference on Microfinance: Translating research into practice, held at the College of Agricultural Banking -- Reserve Bank of India, in Pune, which was cohosted with the Center for Micro Finance, IFMR, Chennai. An international research conference, organised by IGIDR, sponsored by Benchmark AMC, BSE, British High Commission, NSE, Nomura Securities. Implications of the "Flash Crash" for Indian securities regulation by Susan Thomas. 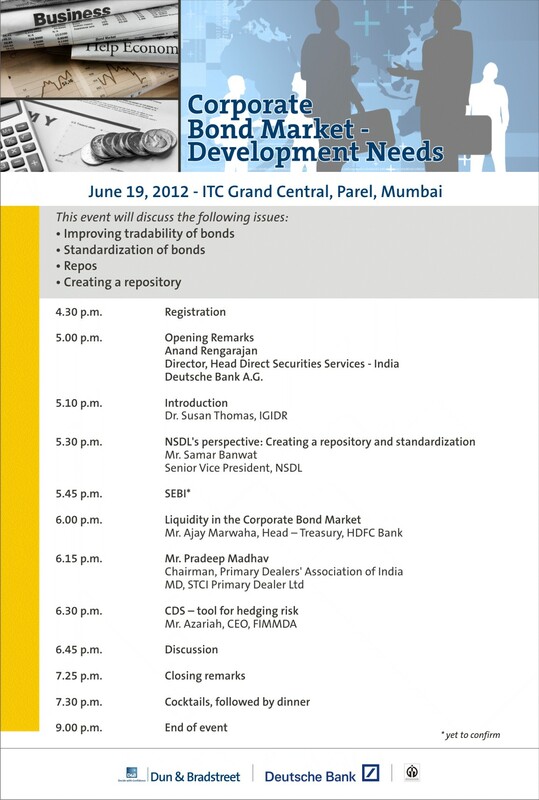 Presented at the roundtable on What India should learn from the US 6 May 2010 flash crash organised by SEBI, Bombay. The deliberations of this roundtable were referred to in the Economic Times, 4 Feb 2011. Flyer for the workshop held at IGIDR, taught by Diethelm Wurtz, ETH, Zurich, and organised with Mahendra Mehta of Neural Risk Consulting Pvt. Ltd. R is the remarkable platform for data analysis and computation. The mutual fund industry in India: where to next? A talk, by Susan Thomas for the session on The changing dynamics of fund distribution -- the boundaries of financial reform held at Taj Gateway room, Bombay. All the files in one .zip file.